They gave him the newest and most powerful battleship in the fleet. Then they tried to kill him. Now it’s war. Jason Hunter, former Flight Leader of the infamous Bandit Jacks Fighter Squadron, has become the youngest Captain in Skywatch history. When an Admiral’s ship disappears in the contested Gitairn Sector, Hunter re-unites his pilots to take command of DSS Argent, a brand-new five-million-ton strike battleship equipped with heavy weapons and squadrons of Paladin ground assault mechs, legendary Tarantula-Hawk hunter-killer gunships and next-generation Wildcat and Yellowjacket fighters. Skywatch Command is well aware Gitairn is a powder keg and that Argent might be the match. When a Sentinel planetary defense battery and surrounding minefield are discovered in an asteroid field where no human should be, Hunter is forced to call in reinforcements led by his twin sister Commander Jayce Hunter and her advanced battlecruiser, DSS Fury. Before long, Argent is leading a 12-ship task force against enemy capital platforms ranging from heavy battleships to fleet strength carriers. Hunter’s best marines, gunships, bombers and fighters will be put to the ultimate test against space pirates, interdimensional aliens, saboteurs, carnivorous insects, ghost ships, paranoid officers and a mysterious enemy so alien even its allies can’t understand it. 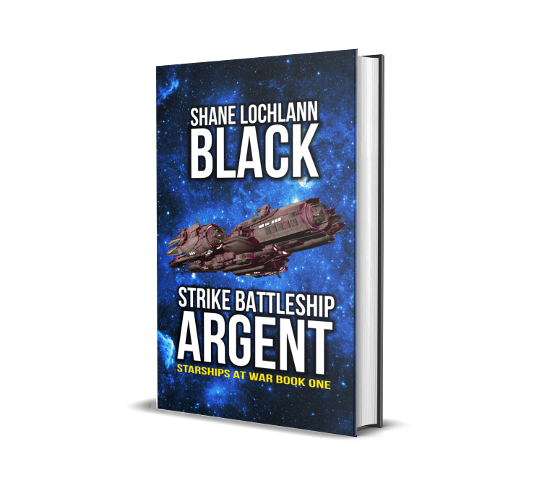 Buy Strike Battleship Argent at the Palace in the Sky Bookstore!